Here’s the follow-up from the Grilled Stuffed Poblano Pepper post, in which, as you no doubt remember, I was going to make fajitas, but the success of the stuffed poblanos happily changed our dinner plans to this marinated flank steak and the stuffed poblanos. But I will one day get around to making fajitas! Flank steak is a flavorful cut of steak that’s a little tougher than some cuts, but cooked just right (medium-rare to medium) and cut in thin strips across the grain, is really good. 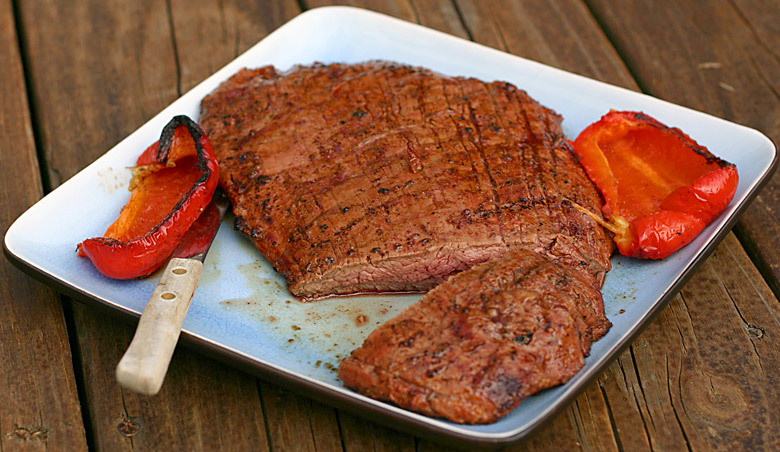 Flank steak is often used in Mexican meals like fajitas, burritos, or just with a side of something like the aforementioned Grilled Stuffed Poblano Peppers. Flank Steak, 1 lb. or so. Mix all the marinade ingredients and combine in a one-gallon ziplock bag with the flank steak. Let marinade for 4 hours to overnight. As always, heat up enough charcoal to cover 1/2 of your grill and soak some pieces of your favorite smoking wood, as mentioned in previous posts like Perfectly Grilled Filet Mignon. Also, since the steak is marinated, put some foil on the cooler non-coal side to catch the marinade drippings. When the coals are ready, spread them out on 1/2 the grill and throw on the drained wood chips. Start the steak on the cooler non-coal side. Since flank steak is thin, it won’t take long to get to medium rare/medium– 4-5 minutes on a side on the indirect heat side, and 2 minutes or so on the hot coal side to finish the steak off with a little sear. I don’t bother with a meat thermometer when the steak is this thin, I just go by touch. A good guide to go by is feeling the pad on the palm of your hand under your thumb– if you touch your thumb to your index finger, that’s what rare feels like. Thumb to middle finger is medium-rare. Ring finger- medium/medium well, and thumb to pinky is well-done. If you decided to make fajitas, grill some vegetables along with the steak– cut a red and green pepper and an onion in half, coat with a little olive oil, sprinkle on a little salt & pepper and throw them on the grill too. Once the peppers and onions are done, cut them into thin strips that can fit in tortillas easily, along with some avocados and maybe diced fresh tomatoes. serve with your favorite salsa and shredded cheese, and maybe even some sour cream if you want to get crazy. As for tortillas– flour is most common but I like corn tortillas. Either will make good wraps for your fajitas. Enjoy!